Official artwork of Knuckles for Team Sonic Racing. Knuckles the Echidna (ナックルズ・ザ・エキドゥナ, Knuckles the Echidna) is a character from the Sonic series. Knuckles digging for a piece of the Master Emerald on Red Mountain in Sonic Adventure. Knuckles first appeared in Sonic the Hedgehog 3 and is one of the main characters of the Sonic the Hedgehog series. He was tricked by Dr. Eggman into thinking that Sonic was evil and was trying to steal the Master Emerald. Since being tricked, he did all he possibly could to slow Sonic's journey down. Since then he has realized that Sonic was the ally, and they have become friends. Knuckles' most recurring personality flaw is his immense gullibility, having been tricked by Eggman more than once to collect the Chaos Emeralds under a hidden agenda, which sparked numerous fights between him and his ally Sonic, only for the former to realize too late he has been fooled. In recent games, this flaw seems to have disappeared altogether. Knuckles is aptly named for both his spiked gloves and immense physical power in his fist, only rivaled by Sonic's supersonic speed. Knuckles lives on Angel Island, and he is constantly tasked with guarding an ancient and powerful jewel known as the Master Emerald, which is said to be able to control the power of all seven Chaos Emeralds. Knuckles (left) on Green Hill Zone in Brawl. 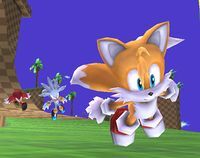 Knuckles, like Tails and Silver the Hedgehog, appears running through the shuttle loop in the background of Green Hill Zone. Just like many other characters in the Sonic series, Knuckles appears as a Sticker that Sonic can use and a Trophy in the game. 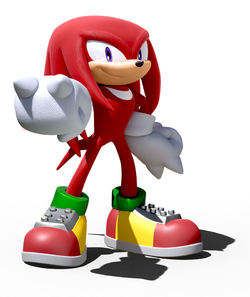 A powerful red echidna also known by his full name, Knuckles the Echidna. Knuckles resides on Angel Island, where he guards the Master Emerald. Both friend and rival of Sonic, Knuckles is a martial-arts expert who can glide through the air. Two Mii Brawlers dressed as Knuckles. Knuckles reappears as a background character in Green Hill Zone in the 3DS version. Knuckles appeared as a downloadable Mii Brawler costume as part of the final wave on February 3, 2016. 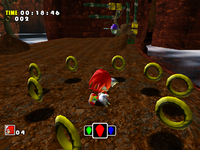 Knuckles's trophy appears in both versions. In Super Smash Bros. for Wii U, it is part of the Sonic & Friends Trophy Box. Knuckles the Echidna is the dedicated guardian of the Master Emerald, rarely leaving his post on the floating Angel Island. His serious, one-track-minded approach puts him at odds with his rival, Sonic, but the two somehow manage to be friends all the same. Knuckles as he appears in Ultimate. Knuckles appears in Ultimate as an Assist Trophy. He attacks opponents with Homing Attack, and also digs into the ground and then uses an uppercut to attack. He may also simply punch opponents with his fists. He also once again appears as a background element of Green Hill Zone. When playing on the stage, his assist trophy will not appear. Knuckles is voiced by Travis Willingham, though like Sonic and Shadow, it is via recycled voice clips from other Sonic games. A Mii Brawler wearing the Knuckles hat and costume. The Knuckles Mii Brawler costume from the previous game was not in the base game, but was rereñeased as DLC on April 17th, 2019. Knuckles also appears as a summonable primary Spirit. He can be summoned with the spirit cores of Muddy Mole (a character who digs through the ground like Knuckles) and Gordo (a character with spikes like Knuckles' fists). Knuckles as an Assist Trophy in Super Smash Bros. Ultimate. Knuckles posing on Green Hill Zone. Note that this is impossible in the final game. Knuckles attacking Kirby with an uppercut on The Great Cave Offensive. Knuckles posing with Sonic on Palutena's Temple. Knuckles mid-air on the Umbra Clock Tower. The picture of Knuckles with Sonic on Palutena's Temple on the Ultimate website is likely referencing the Sky Sanctuary from Sonic & Knuckles, of which Knuckles is often associated with. The Sky Sanctuary is also where Sonic saved Knuckles in Sonic Generations. This page was last edited on April 21, 2019, at 01:04.